To showcase men from different walks of life who are fabulous positive non-violent and non-sexist male role models. To provide dads worldwide a positive platform to share ideas about stopping sexism, misogyny, and violence against women and girls. This is our 5th annual 30 For 30 campaign and through it we will be publishing a short interview with a different Dad on each day of the month of June. Our twenty-first “30 For 30″ 2016 Dad is Carlos Fernandez Gutierrez from Spain. This interview was originally in Spanish and part of “30 Padres para 30 Días” – a blogging initiative for all Spanish-speaking fathers that was inspired by the 30 For 30 campaign. 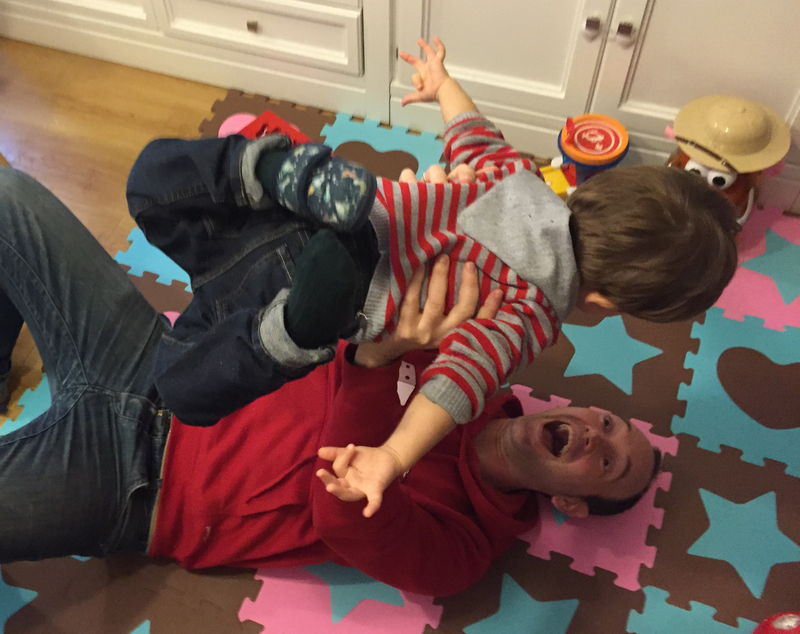 “30 Padres para 30 Días” is a joint project by Papás blogueros (Dad Bloggers) and Madresfera (Mumsphere) – two Spanish language parenting blogger communities. This interview was translated by Nilsa Limaris Correa-Padilla with additional support from Maria del Rio Sanin. Formerly a physicist and an electrical engineer, Carlos now works as an expert on SEO, usability and web analytics. He is a part of the social movements @papiconcilia and mamiconcilia.com (link in Spanish) that facilitate conversation and communication about family, work and gender roles. To receive unconditional love from a little person that you helped bring into this world. To see his face, his sincere eyes, and how he discovers the world and to see the world through his eyes that ignores the everyday misery. To rediscover everything and help him achieve his goals. To give back all that unconditional love to that little person and to my partner that helped me bring him to the world. A thousand more things that I learn every day and the all the others days I will learn in the future. Like the question says, my father has been my main reference for my behavior. To see how he shared the home chores with my mother, cooking or any other chore with us (my sister and I), made me want to help around the house since I was a little boy. He always believed in equality, and sometimes he had to stay home and my mother was the one to bring money to the house. They are a team and they have change positions on that team but the result has always been the same. He also taught me that when injustice appears because of gender differences, it is necessary to join forces to stop it. We are what we see. I mean, if a boy sees macho attitudes at home, in the future he will reproduce those attitudes and it will be something normal for him; the same way I saw shared responsibilities and equality at home. We should teach our kids equality also, that the gender doesn’t determine anything. That we should treat everybody like human beings and if a boy doesn’t see violent attitudes towards women anywhere and sees girls and women as equals, this type of violence will be eradicated. For me, violence against women is an aberration. It is also a human rights issue because in some countries where the law regards women are inferior to men, men have all the rights over women and can dispose of them as they want, like any other possession.